St Louis Ribs, Dr Pepper BBQ Mop, the Best! it is truly one of my great passions. I love everything about it, from the long cooking times, the bold flavors, the smokiness, the grilling ambiance, the flavors, ingredients… everything. Meat, wood, fire…. it’s how god intended us to prepare our food. And for good reason. I’m convinced if He ate a mortal meal with us, here on earth, it would probably be barbecue. Now, all that being said, I have mentioned before that BBQ varies from region to region. The only true constants are the meats used, and the use of slow hardwood smoking. I am not particular to any specific region; I think they are all good, and each has their ups and downs. I also think that overall, if I had to choose, Kansas City bbq would probably be my favorite, due to the complexity and depth of flavor, and the sweeter preparations. As opposed to Carolina preparations, which focus more on heat and vinegar. And Texas, which highlights dry rubs. It’s all about personal preference. Even in the world of BBQ, ribs have their own very special place. 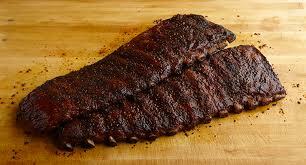 Nothing, and I mean NOTHING, tops well prepared, smoked, tender and delicious fall – off – the – bone ribs. I have posted about ribs before (http://chefnotebook.blogspot.com/2012/08/fall-off-bone-tender-and-delicious-bbq.html), and the following preparation isn’t exceptionally different. It does, however, include two specific additional ingredients that I have recently (and pleasantly) learned make a world of difference. Cooking the ribs for about 2 hours in a Dr Pepper broth (that’s right) adds an almost magical element to the final product. And rightfully so, Dr Pepper contains acid, sweetness, and complex flavors, perfect for tenderizing, breaking down and flavoring meat. It’s insane. And curing the ribs for about 2 hours prior to cooking in a dry rub of maple sugar, salt and various spices. Maple sugar is an amazing ingredient, and works so well with bbq. It really makes a difference, and I wouldn’t ignore or substitute it with anything else. If you follow this recipe, you will be the star of the show. You will have a ‘secret recipe’ people will kill to get their hands on. I believe in it that much. Mix the sugar, salt, paprika, garlic, ground pepper and mustard together. Evenly coat the ribs with the dry rub and let sit, refrigerated, 2-3 hours. Pour the dr pepper in a large stock pot and place the ribs in the pot. Add water or chicken stock until the ribs are completely covered. Add all the dried peppers, onion, and remaining dry spices. Bring to a low simmer and cook for about 2 hours, or until tender, but not falling apart tender. Remove the ribs from the cooking liquid and let dry. Lightly re-apply dry rub. Have a wood grill with hardwood ready at medium to low heat. Ensure an area of the grill is designated as ‘indirect’. Oil the grill. Place the ribs on the grill and lightly char on both sides. Liberally apply the bbq sauce and stack the ribs on top of each other on the indirect part. Continue to rotate the ribs, ensuring you continue to stack them (one on top of the other, so only one rack at a time touches the grill). Stacking allows them to slow cook, rotating the contact point, and the natural juices will run onto the ribs, continually basting and flavoring the cooking ribs. Continue this process and continue to apply bbq sauce until the ribs are extremely tender and smokey. Remove from grill serve.